The M4i.66xx-x8 series arbitrary waveform generator (AWG) cards use the Gen2 8-lane PCI express interface for Gbyte per second upload of signal data from the computer. The combination of large on-board memory and ultra fast data transfer allows a short or long and complex signal to be generated, whichever is desired. 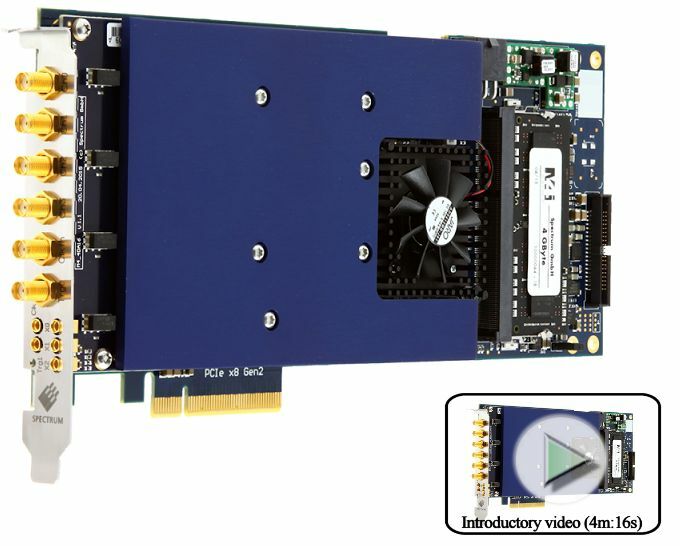 The PCIe interface and the three-quarter length PCB are designed to be compatible to many computer and chassis combinations. The latest D/A converter design is utilised, providing up to 1.25 giga sample per second updates on the output channels. Updates are simultaneous and resolution high at 16 bits. This results in an exceptional combination of speed and resolution without the penalty of low signal amplitude. The output produces a maximum output swing of +/- 2.5 volts into 50 Ohms , +/- 5 volts into high impedance at 625 mega samples per second and only a little less at over a GHz! Using the Star-Hub option this card can be precisely synchronised to other Spectrum M4i.66xx cards to provide an increased number of channels. Versatile Windows / Linux drivers provide a means of programming the AWG in text code, MATLAB, LabVIEW and LabWindowsCVI. Whilst the cards have been designed using the latest technology, they are still software compatible with the drivers from earlier Spectrum waveform generator cards. Hence existing customers can use the same software they developed for a earlier Spectrum M2i AWG card with just a few code tweaks. Extensive support for text programming includes Visual C++, Borland C++, Gnu C++, LabVIEW, MATLAB, Visual Basic, VB.NET, C#, J# and Delphi code. [SBench 6.x] Windows / Linux download allows testing of SBench functionality with or without hardware. More information can be easily requested from our catalogues and pricing web page, or feel free to contact Dataquest Solutions directly.